ემი ჯეიდ უაინჰაუსი (ინგლ. Amy Jade Winehouse; დ. 14 სექტემბერი, 1983 — გ. 23 ივლისი, 2011) — ბრიტანელი სოულ, ჯაზ და რიტმ-ენდ-ბლუზ მომღერალი და სიმღერების ტექსტების ავტორი. მისი 2003 წლის სადებიუტო ალბომი — Frank მერკურის ჯილდოზე იყო ნომინირებული. 2007 წლის 14 თებერვალს მან მიიღო ჯილდო „Brit Award“ საუკეთესო ბრიტანელი შემსრულებელი ქალბატონის ნომინაციაში, ისევე როგორც სამჯერ - აივორ ნოველოს ჯილდო. გამოსცა ორი სტუდიური ალბომი. გარდაიცვალა 2011 წლის 23 ივლისს. ემი დაიბადა საუთგეიტის (ლონდონი) რაიონში, ბრიტანელი ებრაელების ოჯახში, დედის მხრიდან რუსული ფესვებით. სწორედ მისი გავლენით ემი დაინტერესდა ჯაზით. მამამისი, მიტჩელ (მიტჩ) უაინჰაუსი, ტაქსის მძღოლი იყო. დედა, ჯენის უაინჰაუს სიტონი ფარმაკოლოგიით იყო დაკავებული. ბებია, როგორც ცნობილია, დიდი ხნის წინ რონი სკოტის შეყვარებული იყო. ემის ძმა, ალექსი, მასზე ოთხი წლით უფროსია. მიტჩი ემის ხშირად უმღეროდა ფრენკ სინატრას სიმღერებს. ემი იმდენად მიეჩვია სიმღერას, რომ ყოველთვის ღიღინებდა და კლასში მისი გაჩუმება რთული იყო. გოგონას მშობლები დაშორდნენ, როდესაც შვილი 9 წლის იყო. ამავე პერიოდში ბებიის, სინთიას შემოთავაზებით, დედამ ემი მიიყვანა სიუზი ერნშოუს თეატრალურ სკოლაში. 10 წლის ასაკში ემიმ ბავშვობის მეგობარ ჯულიეტ ეშბისთან ერთად დააარსა რეპ-ჯგუფი Sweet 'n' Sour. ერნშოუს სკოლაში ის 4 წლის განმავლობაში სწავლობდა, შემდგომ კი გადავიდა სილვია იანგის თეატრალურ სკოლაში, საიდანაც გარიცხული იყო 14 წლის ასაკში - თითქოს და დაუსწრებლობისა და ცხვირის პირსინგის გამო. თუმცა, სილვია იანგი ამ ინფორმაციას უარყოფა - „15 წლის ასაკში იგი სკოლებს იცვლიდა - გავიგე, რომ გარიცხეს, მაგრამ სინამდვილეში ეს ასე არ იყო. მე მას არასოდეს გავრიცხავდი.“ სილვია იანგის სკოლის სხვა მოზარდებთან ერთად იგი გამოჩნდა გადაცემის The Fast Show 1997 წლის ერთ-ერთ ეპიზოდში. პარალელურად ის სხვადასხვა სასწავლო დაწესებულებას იცვლიდა. მთავარი სტატია : ემი უაინჰაუსის დისკოგრაფია. ↑ Niv Elis. “Surprise! They're Jewish!“, Moment Magazine. წაკითხვის თარიღი: 19 June 2011. ↑ “1911 census reveals David Beckham's rag and bone man ancestor ... and who lived in your house before WW1“, Daily Mail, 2009-01-13. ↑ Mulholland, Garry. "Charmed and Dangerous." The Observer. 1 February 2004. Retrieved on 28 October 2006. ↑ Eliscu, Jenny. (14 June 2007), "The Diva and Her Demons." Rolling Stone. (1028):58–69. Retrieved 23 July 2011. ↑ Sanderson, Elizabeth. "Amy Winehouse's mother explains why she feels powerless to stop her troubled daughter’s descent into hell of addiction." Daily Mail. 18 August 2007. Retrieved on 1 July 2008. ↑ Sturges, Fiona. “Amy Winehouse: Singer who won the hearts of millions but was unable to overcome her dependency on drink and drugs“, 25 July 2011. წაკითხვის თარიღი: 28 July 2011. ↑ Sandall, Robert. "Can Amy Winehouse be saved?" The Times. 27 July 2008. 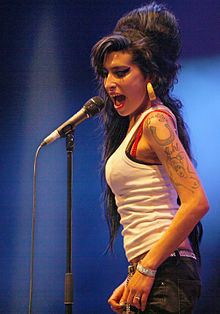 ↑ Singer of the Week – Amy Winehouse. AskMen.com. წაკითხვის თარიღი: 2 September 2008. ↑ “Amy Winehouse: 1983-2011“, The Telegraph, Telegraph Media Group, 23 July 2011. წაკითხვის თარიღი: 25 July 2011. ↑ Braddock, Kevin. "Fame Academy: The Brit School." The Independent 28 January 2007. Accessed: 17 May 2008. ↑ "Dan Gillespie ", The Gay & Lesbian Awards, Retrieved 27 May 2009. ↑ Osidge. Hidden London. წაკითხვის თარიღი: 27 May 2009.
ეს გვერდი ბოლოს დარედაქტირდა: 18:17, 13 მარტი 2019.